South Indian restaurant on Cowley Road where Dil Dunia (and before that, Al Mumbai) used to be. Page last edited 2013-11-25 19:49:42 (version 36). Indian restaurant on Cowley Road where Dil Dunia (and before that, Al Mumbai) used to be. Trichy Dosa serves South Indian food such as dosas (thin crispy pancakes), idli (steamed cakes made from ground rice and lentils), vadai (savoury doughnuts), and utthapam (thick soft pancakes/"Indian pizza"). They are licensed. 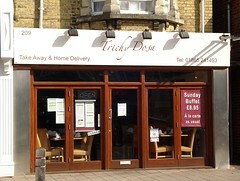 They also do takeaway, delivery, and online ordering via Hungry House and via Just-Eat. Accessibility: No steps to get in, and it's step-free throughout including to the toilets. They have booster seats available for babies and children. Last edited 2013-11-25 19:49:42 (version 36; diff). List all versions.